I know it will not be me..
utterly destroys you out there. I really do. So getting to Phoenix (the race is actually in a suburb called Glendale.. but Phoenix is sufficient) was relatively uneventful. Smooth flight, easy pickup of rental car, very straightforward (about 30 minute) drive to the hotel (which is only a couple of miles away from the race.. which came in handy) and was very close to this complex called “Westgate” (which I very much recommend to get a huge selection of good restaurants) where I had a late lunch. Getting back to St. Louis once the race was over was the opposite of smoothness but more on that later. Knowing that the race had already started when I got there (I arrived on Saturday the 28th and that was the first day of this event and many of the dozen or so races had already begun) I couldn’t think of anything better to do than go out there, get my packet and goodie bag and check out the races! The first thing that I was immeadiately struck with was the organization of this race! Wow. 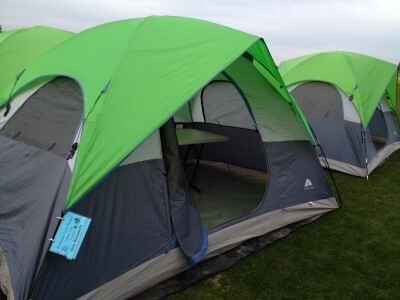 Huge and separate tents for packet pickup, aid station, first aid, “hot” tent, judge’s tent etc. Amazing the amount of work that went into the organization of this event.. and it benefited the runners, the volunteers and everyone else (I imagine) tremendously. I will write this many times but.. 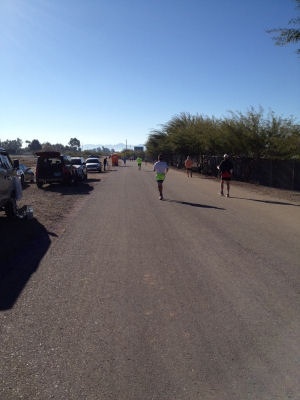 I cannot say enough great things about Aravaipa Running and how they put on a race! 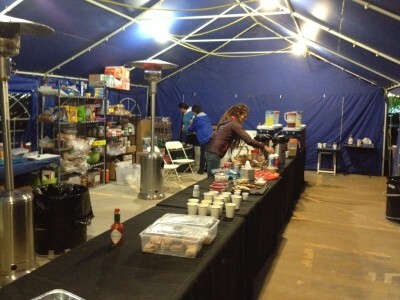 A shot of the interior of the aid station is below. I would come to find out throughout my race that they produce high quality catering level food all day and all night! I don’t know how many times I shook my head in disbelief as to the quality of food I was eating at a race. A genuinely nice and sturdy (with tons of pockets and a comfortable shoulder strap) gym bag, an awesome looking and fitting long sleeve running shirt, an Across the Years thermal mug, a super comfortable fleece beanie (which I used during the nights), a super comfortable fleece jacket (which I used during the nights) and a pair of mittens (which I didn’t use at the race because they were a bit too light.. used the thicker ones that I brought with me that I could put hand warmers into). Brilliant!! He proceeded to point to where the bank of tents that had a table and one cot set up in them (which I had rented on their site months ago) and I walked over to them to find and tag mine. I was to find out a few minutes later that many (I would say perhaps 50%) had pulled their tables out and lined them along the course so as to make for easier access to their items of need. I thought about doing that but there wasn’t much room available at that point (I could have found a space) and for some reason just thought that it would be better to have everything available in my tent when I needed it. It didn’t seem like much to ask of myself to walk 80 feet off of the course to get to my tent to get what I needed… little did I know what a struggle it would be to get into the tent (that damn 6 inch lip got harder and harder to lift my legs over as the days went on 🙂 No really… I cursed it many a times on the second day) and so I was basically done for the day. Having accomplished what I needed to, I walked to the edge of the course near the lap counters and watched the runners for about 30 minutes. He was running through very gingerly and easily at this point (which was to be expected at 7 hours into a 6 day race) but I was struck by his gait which was a combination quick shuffle with his shoes sort of gently jamming into the ground with a slightly exaggerated twisting arm pump (sort of look liked a downward punch) . It didn’t look like the most efficient or comfortable stride to be honest.. but how could one argue with a runner who holds multiple world records in the sport of ultra marathon. It was very cool to see him as it definitely fired me up and reminded me of the level of runner that I would be priviledged enough to be running along side for a couple of days. I was ready to go at that point. Wanted to get some more food in me, analyze everything back at the hotel room that I would be taking with me to my tent the next day (I wanted to have everything set up and ready to go on Sunday) and just generally rest. So that is what I did. I got back and opened all of my suitcases (I brought a lot with me… thankful for being able to check in two bags for free with Southwest!) and pulled out everything that I planned to take with me the next day to the tent. I don’t remember much else from the rest of the night as I think it was generally uneventful… except I was very much still (even at this point) deciding whether or not to switch to the 48 Hour. I slept well on Saturday night (and long if I remember right.. at least 9 hours). I was happy about that because they say that the most important night to get rest for a race is two nights out.. it is unusual (and would be the case again for me at this race) to get a lot of sleep the night before a big race but if you get a solid nights sleep two nights out you should generally be ok. I had planned to do some sight seeing on Sunday before I flew out. 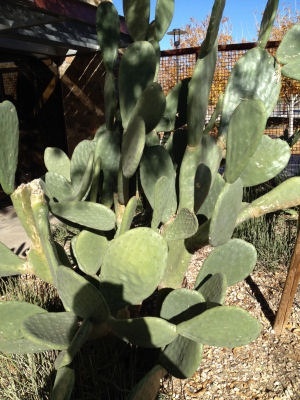 I could have driven to Sedona or Flagstaff…. seen some cool red rocks or whatever. It seemed to make sense before I came out there because there (in theory) wouldn’t be much for me to do (as I would have had both Sunday and Monday off before the race) but I just didn’t really feel like it. I have to say that the energy at that race was just overwhelming to me on Saturday and even though there wouldn’t be much for me to do there on Sunday.. I just wanted to go back, take all the time I needed to set up my tent and relax and enjoy some more of the show! I don’t regret that at all. The mental state that I was in at that point, driving a couple of hours to go to another city would have been both meaningless and unnecessarily tiring. 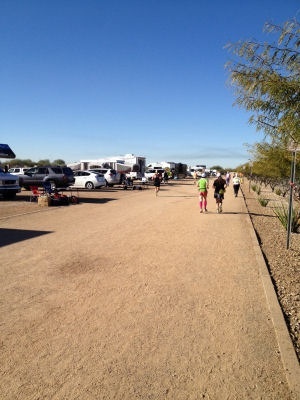 I love traveling and seeing new places, but on that day I was where I needed to be… I was at the race! I got up and did the complimentary breakfast at the hotel (it was fine and had what was to be expected.. typical continental complimentary hotel breakfast) and then proceeded out to the race (after laying around for an hour or so). I packed the duffle bag that I brought with me and the new one that I got from Across the Years (and also brought one of the hotel pillows to put on the cot… I didn’t feel bad.. I was going to give it back to them) with everything that I planned on setting up in the tent and I was back to the races! and was essentially ready to go but I did wait until the morning of the race to fill up all of my Fitletic water bottles. I show them filled on that morning below. I knew that it would be hard to find my tent at night (it gets really dark because the lighting that they had set up on the course didn’t come back to the tents at all) so I wanted to make it somewhat different visually from the tents around it (I highly recommend this) and took a long piece of yellow rope (that I was thinking I might use to stretch with but that didn’t happen) and tied it from one end of the entrance to the tent to the other. It definitely did help during the nights when I was trying to find it. I then locked my tent (yes I put a lock on it… I don’t know how many runners did but I was reading about a Twitter friends 24 Hour Race in September and she said that during the night many tents were broken into.. the level of despicableness that doing something like that demands boggles my mind and while I had no reason at all to think that that was going to happen at this race… I simply could not come up with a good reason not to.. I had $1000s worth of stuff in there and I really needed it for the race… and wanted to be able to take them home as well) and stood in the sun for a few minutes ready to make a final decision…. 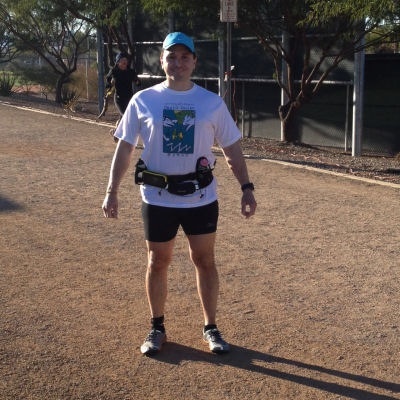 I really want to get that 100 mile buckle and doing that in 24 Hours is a goal that many ultra runners chase for years…. OK I’M SWITCHING TO THE 48 HOURS!! 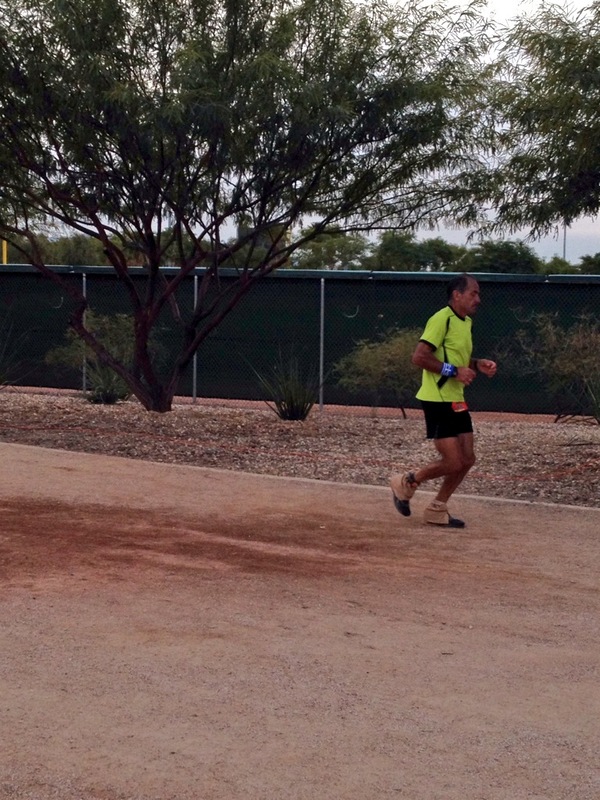 I went to Nick (one of the Coury brothers who run Aravaipa Running) and made sure that I could do it. He said sure no problem… I just pay the difference and they would immediately change me in the system and I would show up in the online results under the 48 Hour tab. DONE!! So I would be starting at 9:00am on Monday morning and now I just had a few things to buy, eat a few more times and get to sleep for the big race tomorrow. I needed to get a lot of water for my tent (they had water at the aid station… along with all sorts of other beverages and food… but I wanted to use my drinks in my water bottles for as long as I could and having the water there in my tent would make it easier), a good amount of Coconut water and a flashlight for the tent (would have been utterly impossible otherwise). There was a Super Walmart right behind the hotel so that is where I went. It only took me about an hour to find those three things in that place (damn they are big) and I brought all of that back to the tent. I don’t actually remember anything else of any significance from that point on Sunday until dinner that night. 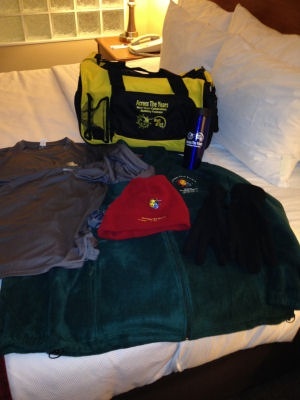 It is generally easy to figure out the runners in an upcoming race when you are at the hotel or out around it, because of both how they are dressed (running shirts are a giveaway as are running shoes and running specific jackets) and for most (myself excluded) because of their “runners build”. I saw what I thought was one (with his family) at a table across from me and (being the generally social person that I am.. and also just being excited/nervous about the race) I asked him (hoping I wouldn’t look foolish if he had no idea about any race) and as I am not one to call out someone on a public forum… let’s just call him “Z”. So what race are you doing? Oh that’s cool! So am I. It will be my first 48…actually was going to be my first 24 but I switched. Have you done this type of race before? Yes I actually won the race “Something Something” in New Jersey. Oh that is great! Maybe a little quick in the conversation to spout off your accomplishments. No I have never heard of that one but that is really cool. So what are you looking to hit in this race? Around 200. I did 202 at the New Jersey race, but not sure how perfect my legs feel at the moment. So why did you switch to the 48 Hour? Having come all the way out here, I really wanted to try and hit 100 and I just don’t think I am ready to accomplish it in 24 Hours. Umm yeah.. I’m not a great runner but think that it would still be a pretty cool accomplishment (he didn’t even look up). Who in the hell do you think you are?! When did I ever claim to anyone to be a great or even very good runner? 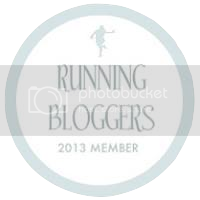 I am just trying to do my best to do something pretty cool and very challenging for a relatively average runner. Most people I talk to think that what I am attempting is somewhat crazy and somewhat of an accomplishment. When someone tells me that they just ran their first Half Marathon in 3:00, I tell them I think that is fantastic! How very cool to accomplish something (no matter how long it took you) that most will never get to experience. I know the trials you went through in training and it is so cool that you did it! You lost 50lbs and just ran your first Marathon.. how badass is that! You had never ran in your life and just completed your first 5K with a huge smile on your face… I am so insanely excited for you! I was never in danger of being your competition and yet you thought it cool to attempt (emphasis on attempt because your **** did nothing but embolden me to do my best and love it!) to cut me down! I have literally never personally met such a **** in all of my ultrarunning career. I didn’t say or do anything else (not my style) but when he looked up for a bit from his plate, I just stared at him without blinking until he looked slightly uncomfortable and then looked back down at his plate. More on how that story plays out in Part 2. For some reason… no idea why except possibly just nervous energy… I woke up at 3:00am on race morning and laid there for a bit but knew that I was not getting back to sleep so I got up and took a shower. I spent another couple of hours just sort of doing nothing then went downstairs to get another complimentary breakfast. He told me that he was also doing the 48 Hour starting at 9:00am (his first) and that he hoped to hit around 200 miles. I asked him (I wasn’t sure yet what I was going to do exactly) if he planned on getting any sleep and he said “No. I plan on staying on my feet the whole time.” When he said that I had no idea how that would be possible… or how much I would stay awake.. but I was interested to see how things went. I will write a bit more about Kelly in Part 2… suffice it to say I was rooting for him! I took my time eating because there really wasn’t much of a need to get to the race early (as I had everything already taken care of) and I would be out on that course long enough 🙂 So I got there about 8:15 and just sort of took in the energy from everyone and got ready. The race was about to begin! Another one of those “I look 4 feet tall and 2 feet wide” photos I wrote about in a previous post… for some reason. Ha! The weather felt incredible (about 55 degrees and sunny) and I was really raring to go! I checked the clock under the loop banner (this clock didn’t count down how long into the race like almost all race clocks.. it simply stated what time it was… made sense for this type of race) and the gun went off! 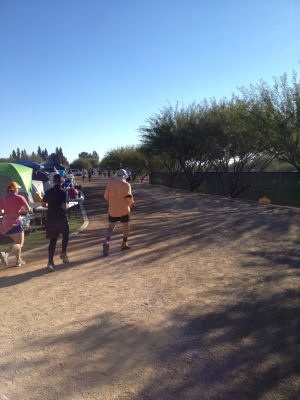 I ran the entire first loop (just to get a feel for the course) and really liked it. The hard pack felt like a wonderful surface to run on (at that point in the race) and there was a lot of different things to run through and a lot of different things to see for a 1.05 mile loop. It was dustier than I anticipated (was told that it was unusually dry for that time of year even for Phoenix) and while that didn’t present any issue for me for quite sometime (and ultimately didn’t present a major issue for me at all)… the ground and what it did to runners feet hit a lot of runners really hard. It was to be a defining aspect of the race for many runners. More on that later. The Plate brothers that I had wrote about in an earlier post (Brandon 13 years old and Cameron 12). 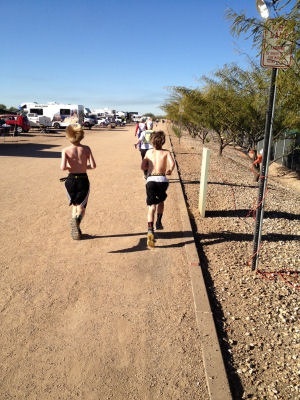 They ran 131 and 112 miles respectfully in the 72 Hour! At this point in the race I felt great… shocking as that might seem being only a few miles into it 🙂 But what I really mean is that my legs felt solid and springy, the temperature felt great, the course was fun and kept my interest, there were a lot of interesting people out there (some already for a bit over 48 hours!) 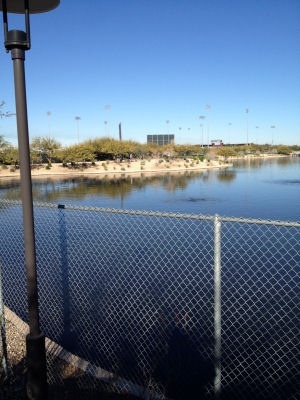 and I was generally really enjoying myself… and glad that I came out to run around a baseball field in Arizona! 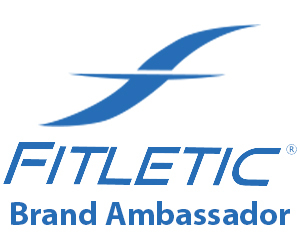 Also having my sponsor Fitletic tweeting out to follow me to all of their followers and posting on their Facebook page was so awesome! 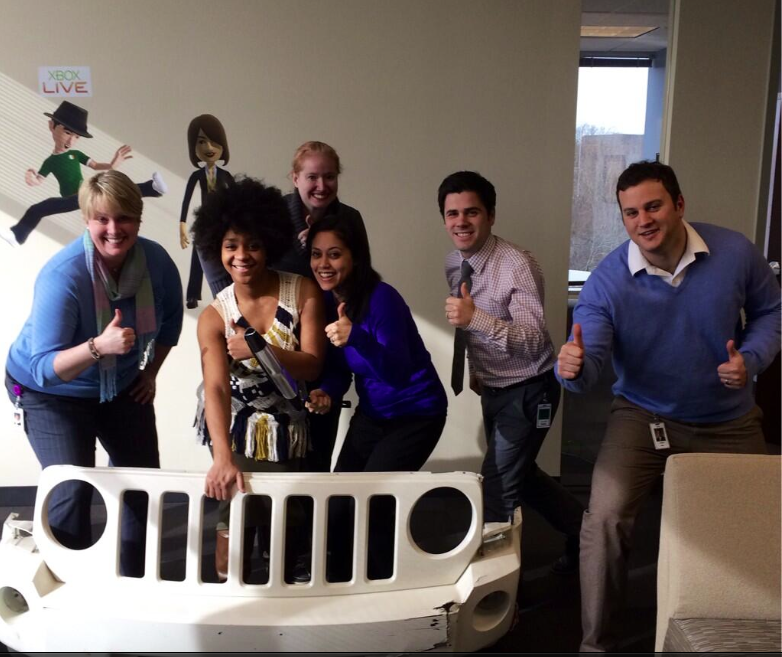 So proud and lucky to be a part of such a great company! Those belts and those bottles helped me!! Throughout the first day (and into the second day) I was drinking various combinations of water, HumaPro, Chain’d Out and Coconut Water and eating almost exclusively (for at least the first 12 Hours until I started to eat the wonderful food at the aid station) the Sticky Bites that I had made. 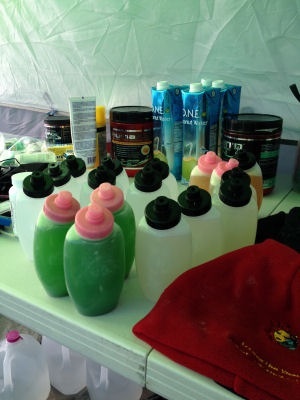 It worked out to about 4 bottles (32 ounces) of liquids and 3 Sticky Bites per hour and then I would make a quick (the first 12 hours they were quite efficient and painless) pit stop to refill. More on my nutrition during the race in a future post, but I have to say I think I really figured things out and my nutrition was almost spot on. No GI issues throughout the entire race! 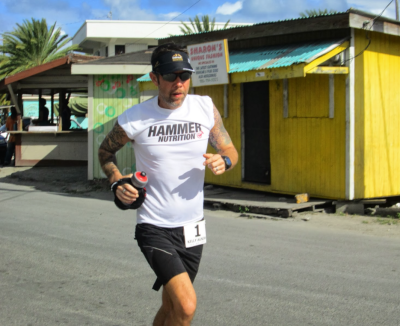 There were a lot of Badwater shirts out there. I think that showed a combination of the race being held relatively close to where we were racing but also the elite quality of a lot of the runners! “I have to remember that this is a different type of race. And not freak out that I’m taking extra long in the tent or so forth.” I wasn’t running a Half or Full Marathon and everyone that was out there was taking some time to get done what they needed to get done at points.. or simply taking some breaks. It is just part of the game. I got over that emotion pretty quickly. My running pace was staying solid at 9:15 to 10:15 pace until past dusk. My walking pace was slowing somewhat… I noticed this in training as well… I think it has something to do with the walking being for recovery and my recovery needs went up a bit as the hours went on. Until about 12:30 the temp was great. Short sleeves and running shorts weather. Feeling good and staying hydrated, but…. it started to get hot and it was 12% humidity out there. It may have only gotten up to about 70 but it was having an impact on a lot of runners. I decided to walk fast for about an hour around 2:00pm because I saw no reason to burn myself out a bit so early in the race. Most other runners (except for the top of the top) were walking more during the hottest part of the afternoon as well. I had heard at the aid station that some runners had passed out from it the day before. I did not want that to happen to me. I poured cold water from the water pitcher over me (reminding myself each time to remove my iPhone from my waist pack first! 🙂 ) each loop at the aid station and made hydration an even bigger priority. Which brings up the point (which I will discuss in the future post about my nutrition and training thoughts) very few runners were carrying anything with them. They were simply drinking and eating at the aid station. Now I know that 1.05 miles doesn’t seem that long, but I learned when I ran Death Valley that extremely low humidity has a serious impact on you and especially since you don’t really sweat you don’t notice it. 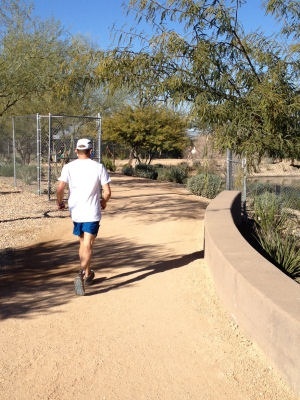 I don’t know why that more experienced runners than myself weren’t running with something with them… but most weren’t and it caught up with a lot of them. I really liked the every 4 hour direction changes! It was amazing how it broke things up and the counter clockwise direction was significantly easier so I always looked forward to that change. The heat really started to get annoying and I was really looking forward to the night (well at least on the first day.. the second day was a bit of a different story). At about 4:45 the sun started to really come down and it began to cool off. At around 5:30 it was night. For about 2 hours (what I termed to other runners “the transition period”) the temperature and conditions were their best of the whole race. 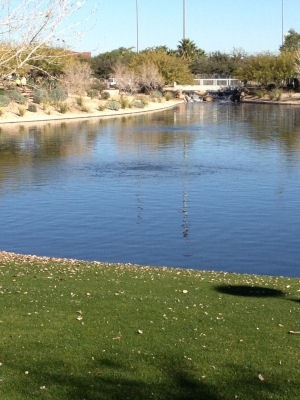 Not too cold and not too hot… just right and It really perked me up emotionally to feel that cool air. All I needed in the beginning was a long sleeve shirt (with a short sleeve shirt over it) but by about 8:00pm I had a hat on, the fleece Across the Years coat, my gloves with hand warmers inside and long sleeve pants over my compression shorts. It started to get cold! And it was a long 14 hours of night! 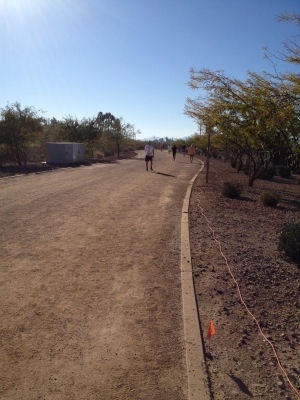 And (I remarked on this to multiple runners) it got pretty lonely because I would say at least 70% of the runners (from all races that were going on… maybe more) left the course. I heard that some were simply calling it quits but most just didn’t want to run at night?! What?! I mean I get it in general that running in the middle of the night in the cold (especially after having run all day) isn’t the most attractive thing.. bu this isn’t training.. these are 1 Day to Multi Day races! I mean you paid for it… get out there and race! At least that is what I (and some other runners) was doing. I stayed on the course until about 2:00am and then went to my tent to lay on the cot for about 20 minutes (I think it ended up being about 25) and taking in 300mg of caffeine through some Vivarin tabs. To be honest (and surprisingly) I don’t know how much I needed the caffeine because I never felt tired that night but I took it. Laying on the cot sucked more than I expected. I was cold and gently shivering and there was no way (even if I wanted to… which I didn’t because I was too scared of staying asleep) I was going to take a nap in those conditions. It felt nice to put my legs up for a bit. It definitely did… but that was the first time (which I experienced dozens of times before the race was over) that I experienced the “**** **** it is hard to start moving your legs again after sitting or laying down at this point forward in the race! !” It took a solid 1/4 to 1/2 mile for them to start to feel somewhat normal again. Uggh! There were points when I just had to sit or lay down, but I always feared the getting up part… because it sucked! Around 3:00am I started to despair a tiny bit… I just really wanted the night to be over (I kept asking other runners… I will feel better when the sun comes back right? And everyone said “Most definitely! You really feel recharged mentally and physically.” I think I asked 6 different runners just to make myself feel better 🙂 There were so few runners out there and I was just sick of the bone chilling cold and the darkness. On another note.. they did do an amazing job of putting up lights (powered by generators) all over the course. It was really something the effort they went to in doing that and it helped a lot (not needing a headlamp was great) but still 14 hours of cold night is a long long long time… trust me! It was during the first night that I did start to eat a bit of the food that they made for us (in deference to what I just wrote above… I did eat some the first night) and my first item was a homemade tamale. It was phenomenal!! I couldn’t get over how good it was and how it really did put a smile on a not the happiest (at the time) spirit. It was also around this time when I noticed the amount of shoes that had been cut off! Over the course of the race, I saw at least a dozen shoes with either the fronts or the side of the shoe literally cut off. The blister situation was that bad out there. Many runners had never experienced anything like it. The only thing that they could come up with was the extra hardness of the hard pack (from being so dry) combined with the steady flow of pebbles and extreme dirt dust. I got hit later in the race but it didn’t affect my running (i.e. didn’t hurt). A lot of Hoka running shoes out there. Still not a fan of them and definitely won’t ever run in them, but I was surprised at how many I saw. I hit my then Personal Distance Record (PDR) of 55 miles at some point in the very early morning and that made me happy at the time. I was over half way (but didn’t know at the time how much tougher the second half would be). When the sun finally came up (around 7:15am) it still took at least an hour and a half to start to warm myself up (a combination of my body being spent and it being cold for some many hours). I hit 100KM and then 65 miles before the 24 Hour mark and while that is not a great 24 Hour by any means… it meant that I only (once again not understanding at that point how tough the second day would be) 35 miles to go. Here is a pretty cool video I made (my first with my new Sony HD video camera 🙂 ) of the night taken on the day before I raced. At the end you see Ed Ettinghausen (the court jester) coming down that final stretch to the loop finish. That stretch was very cool as it was completely covered with a canopy of trees and was pretty dark at night and just felt like a neat place to run. After the first full 24 Hours I hadn’t slept at all but that didn’t really bother me at that point… I felt awake. I felt like I had done some things right and made enough progress that I had a very good shot at hitting my goal of 100 miles overall…. But I was really starting to very gently fall into a strange space (ever so slightly at that point). Sitting down in a chair was frightening because my stabilizers were starting to get shot and my balance was going. I was still cold even at 9:00am, but at the same time wasn’t looking forward to the heat (and it ended up being 4 degrees hotter on the second day) and I most definitely wasn’t looking forward to another 14 hour night! !… so the plan was to hit the 100 mile mark as quickly as I could…. But you know what they say about the “best laid plans of men”…. This entry was posted in races, Running on January 8, 2014 by Chris M.
Many trail ultra runners say the same thing that you did when you first started reading about my race.. not for them… but when they actually try one they find that it is a different type of race and like you said you get to meet (and at times vent to 🙂 ) so many different runners. It makes it nice to know that it won’t be long before you see someone. Plus the strategy involved is really fascinating… there are so many different ways to approach it. The night was fun for a while (I generally enjoy me some night running), but the cold just got brutal after around 6 hours and I was very thankful that there were other runners out there on the course with me. I think you would find a timed ultra to be a lot more interesting and fun than you might of thought at first. Seriously wow! I read through this like a novel I didn’t want to end. As an aspiring ultrarunner beyond 32 miles I love the details. I am glad that you liked it. I really am writing the recaps to that race with the idea of getting into my head and “feeling” what I was feeling during it. Long ultras are so much mental and emotional (in addition to being incredibly physical). I think a lot went right and am pretty certain as to what I could have changed. Chris you are a machine! Yep a novel, but love the detail. Well done. Yes when the race reports are done for this one, they will be much longer than any that I have written… but the race was also much longer than any that I have ever done 🙂 so I guess it makes sense. I’m just now getting around to giving your write-ups the attention they deserve. Well done man! I am enjoying the detail and already silently hoping that the condescending ultradouche got horrible blisters and had to stop and then was forced to watch you lap him 50 times, hahaha. Thanks so much for dropping by and for checking out the first of my reports! It was such an amazing adventure. As I write this.. I am eagerly waiting news on the last day of the Finals of the Worlds. There are so many epic events in so many different sports. 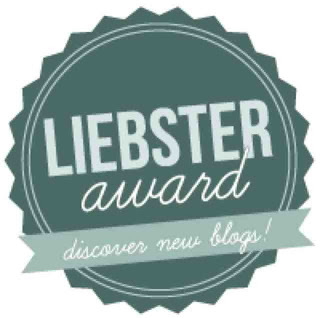 Hope you are doing great and I will stop by your site again soon!